Wayne Bennett: What makes England's 'supercoach' so super? 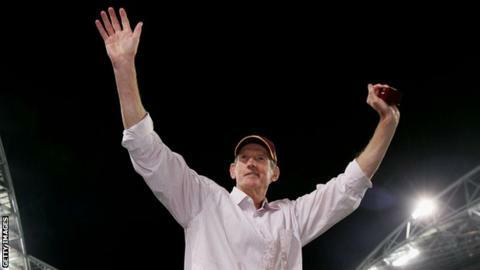 He is known as the 'supercoach', but what exactly is it that makes new England boss Wayne Bennett so super? Seven premierships from spells at Australian sides Brisbane Broncos and St George Illawarra are evidence of his talents, as is a World Cup success in 2008 as assistant to Stephen Kearney with New Zealand. Former Broncos, Australia, Queensland and Wigan centre Steve Renouf flourished under Bennett's coaching, while Australia and New South Wales outside-back Kurt Gidley also played under the 66-year-old at Newcastle Knights. Wales coach John Kear has plenty of experience from his time in the English game and as an international boss. The trio spoke to BBC's Super League Show about some of the secrets behind Bennett's success. International coaches get very little time with the players they select, so building relationships in those short periods is key. With the Four Nations following the Super League and NRL seasons at the end of 2016, Bennett's timescale is limited. Renouf: "He knows what to say, he learns about the individual and he takes the time to do that. "He'll get some ideas off people who know them, but he likes to go one-on-one and is very good at picking personality. He works like that. "One thing he still has and carries with him today is the motivational side. He can be brutally honest when he needs to be." Gidley: "He's a wonderful motivator, he just seems to say the right things at the right times in the least amount of words. "Sometimes people ramble on and say things that end up too complicated for players to understand, but he seems to put it in the simplest terms. "In the dressing rooms, the training field or even the team meal, he'll say something that will stick in the back of the mind." Renouf: "You don't realise how much respect we have, anyone who's been coached under him - he's a father figure to us, and we still talk to him when need be. "I'm 45, and I still speak with him. Guys like (Australia coach) Mal Meninga hold him in such high esteem and one thing good about Wayne is that if he is going to say something to you, you listen. "I was really happy when I did the job for him, when he asked me to do something on the field - even just a little thing and I did it, and it came off - I was satisfied." Gidley: "Everyone respects Wayne, especially with what he's been able to achieve in his career. "We saw the same when he was assistant coach for New Zealand for the 2008 World Cup and they won the competition. I'm sure Wayne's influence had a big part in that." After securing a fine series win against New Zealand in 2015, England begin the Wayne Bennett era with victory fresh in the mind. The key for Bennett will be to build on previous coach Steve McNamara's successes, something he did when inheriting Anthony Griffin's squad at Brisbane in his first season back last year. In the space of a season, the Broncos went from a stuttering play-off exit to a Grand Final - with just a few tweaks to the system and personnel. Renouf: "No-one could have done what he did with those players. We all knew Brisbane had a good team for a couple of years but weren't getting the right information between their ears about their attitude. He came in and changed that. "The squad that made the Grand Final was not too different to what went around the year before. A lot of that was down to Wayne and what he did with the players. "He's got a knack of getting between their ears and getting into their headspace." With Bennett based in Australia in a full-time role at the Broncos, there is already speculation that an English assistant coach will be brought into help facilitate the handover for the Four Nations. Bennett has been used to working with a team of staff, going back to his time at Canberra where he co-coached with Don Furner and the Broncos alongside Kevin Walters and Glenn Lazarus. "He'd had all these mentors, old coaches like Bobby Bax [a former coach of Bennett during his playing career] and Ronnie Spalding, with his AFL background, but you look back now and it was all part of his plan." John Kear: "I think when you've got the best coach of his era - and Wayne is that - who is available and is willing, then you have to seize on it. "With the success he's had over a number of years, that's how you test the quality of a coach. Wayne has been around the block many times and that experience will be fully utilised for England. "I expect us to win the World Cup or Four Nations in the next two years." You can watch the Super League Show on BBC One every Monday in the north of England, with a national repeat on BBC Two every Tuesday and available on the iPlayer all week.